Just when I thought Summer weather was here, we got hit with a nasty, nasty cold spell. Here in Vancouver it rains all the time so when it gets cold it's the damp, bone chilling, make your joints hurt cold. Thankfully I had about 4 lbs of mushrooms in my fridge and an unwavering love affair with cream of mushroom soup. I don't make it too often, I'm not sure why because it's one my favorite soups. When I was a kid I loved the canned Cream of Mushroom soup. It was my favorite amongst all the cans, which is not saying much. Of course we're not talking about soup from a can here. This cream of mushroom soup will restore your faith if you've lost it. This is no gelatinous tube being sucked out of the can with 4 pieces of 'real' mushroom floating around. This soup is chunky and rich and so ridiculously satisfying. Somehow I can't help but think that mother nature was looking out for me that day. After all, what the heck else would I have done with that many mushrooms? Add butter to saucepan and saute onions on low-med heat for about 25 minutes or until translucent. Meanwhile, chop half of the mushrooms into large chunks. When the onions are ready, add the mushrooms and garlic and saute another 5 minutes. Add the wine and increase the heat to med-high. Stir the mushroom mixture while the wine is evaporating, about 4 minutes. Add the flour and continuously stir for 2-3 minutes. Add the chicken stock and scrape up any bits that may have stuck to the bottom of the pan. Bring this mixture to a slight boil and then remove from heat. Allow the mixture to cool and then transfer to a blender and puree until very smooth. Chop the remaining pieces of mushroom into a medium-small dice. 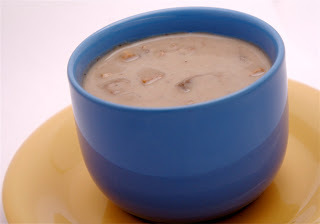 Return the pureed soup to a saucepan, add the thyme, nutmeg, cream, milk, S&P and remaining mushroom pieces. At this point, you can add as much water or milk as necessary for desired consistency. Slowly reheat the soup adjusting the salt & pepper according to taste. Don't bring this soup to a boil. Serve with bread or crackers.